C'est Ci Bon by Eartha Kitt filtered through my speakers, as my thoughts brought me back to Manila. It was as if I was back, waiting for my turn at the salon, sitting on a giant French provincial sofa as I revered at the sparkling chandelier above me. Upholstered in rich deep magenta, the French inspired sofa lends a vintage elegance to the place. Although I was nowhere near Paris, I felt this was a refreshing escape from the heat and traffic of Manila. The place: Salon Beauvior. The salon is staged with opulence and style that would definitely spell out the whole salon experience as L-U-X-U-R-I-O-U-S! Posh, tres chic -- these stylish words came to mind, but without the intimidation. I felt welcome as I was greeted with warm smiles from the staff. 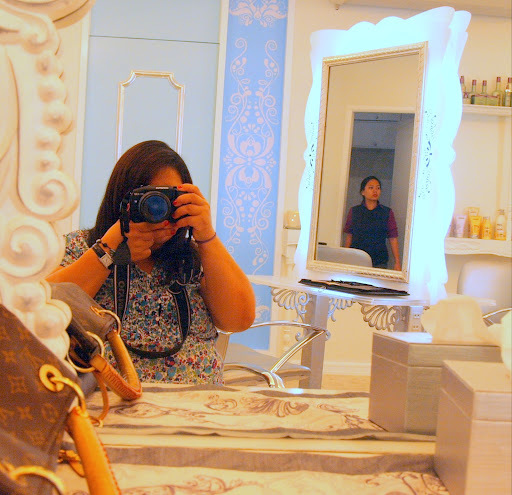 You can't blame me for trooping back to the salon 5 times during my short visit in Manila. "Iced tea, water or coffee?" asked the young lady while I was leafing through a magazine. "Iced tea please," I answered. And the young receptionist's warm, youthful smile and loose, shiny black hair made me wish that after leaving the salon, I would magically transform like her, haha! During my first experience at this salon, Pam was assigned to me to evaluate what I needed to do with my hair. 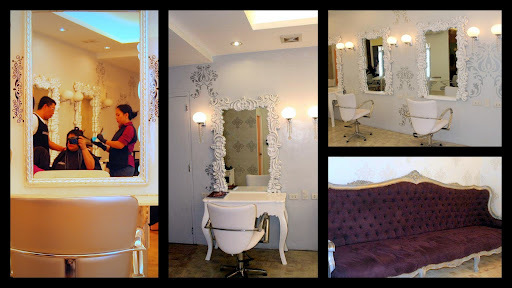 "Salon evaluation" usually scares me but with Pam's expertise, who wouldn't feel comforted? She was trained as a stylist in the U.K. and was a hair stylist and make-up artist for the royal family in Brunei. Her gentle approach and generous beauty tips made me feel as if I was visiting a friend for afternoon tea. So on my last day in Manila, guess where I went to spend the afternoon? At the salon, of course. I was actually torn whether to go to the salon or meet up with my friends for the last time. Solution? I did both. 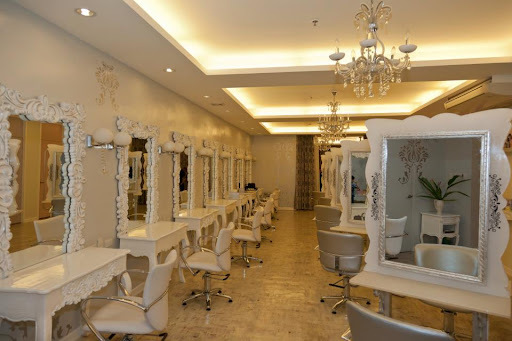 The salon has VIP rooms that you could use to meet up with girlfriends. To go along with the French motif, my friend Tina brought some crepes and macaroons. I had my hair relaxed by one of the salon's senior stylist, Sam, with Girlie assisting him. The process took about two hours, but I had the best of both worlds. I was with my friend Tina, and Sam was transforming my frizzy hair into smooth and silky straight hair. On top of that, he was very entertaining with his funny anecdotes about his travels around the world. Boy, was I impressed by him, as he speaks 6 languages and also carries 26 years of experience as a stylist. A guest celebrating her birthday at the salon with her friends. Check out their FB page for promos and next time you want to meet your girlfriends, the salon is a perfect place to host a cocktail SPArty, or to celebrate special occassions, or to just hang out. Their friendly coordinators would love to work with you for your next event. It's definitely C'est si Bon! Mix flour and eggs together. Add the milk and stir it together. Gradually add the water and stir well, removing lumps until you get a smooth batter. Pour 1/4 cup of batter into a hot pan. Make a circular motion to spread the batter thinly and evenly. When the sides turn light brown, flip it on the other side and cook it for another minute. Don't get intimidated. It's easy, all it takes is practice to come up with a perfect crepe. Spread crepe on a flat surface. Spread a generous amount of nutella. Fold crepes and top with crispy bacon slice. Bon Apetit! But anyway, where is it located again? I really need a "me" time. it's ok I know you went to Europe right? But it's ok with me. They are located in Olympia building near the Intercon. This is an amazing combination for all the right ingredients needed for good health.The presentation is just perfect...I have a lot to learn from your recipes, photography and food styling...will be back for more...great work..
You should just write for a living Malou. You got me convinced to go visit your country because I want to go to Salon Beauvior LOL! It's fancy schmancy dahling. see you this weekend. please keep the crepe away from me for now. bad bad bad pour moi LOL! hahah you are funny. will see you this weekend! don't work too hard haha! What a mix of flavors, I love the crunch of the bacon and the subtly sweet creaminess of the Nutella. Nice. It's so GreAT meeting you. I hope to see you around. Oh, man. You are killing me with that pile of bacon. Fabulous. Snazzy shop. Most salons here are very basic, even the high ends ones. That bacon is calling me. I've recently saw sweet recipe with bacon and I was wondering how it's like. Now with your crepe with crispy bacon!! Looks so delicious and I love to try this one out! YUM~~~! Malou, have a great long weekend! !